This scene is from a photo I took at the Friends school in San Francisco when I was teaching there recently. This plant was down the hall from our room, on the way to the bathroom. I was positively enchanted by the light. And I wasn't the only one. While flipping through a student's camera that week I found she had taken the same photo! I wonder if she'll paint it. Beautiful! 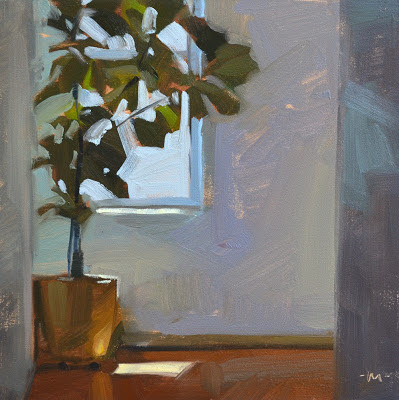 I love the simplicity, and the backlit leaves against the window. This really jazzes me. The leaves have such a gorgeous shape to them, they flow so organically and almost feel liquid.